In this second installment of a series Franny K. Stein creator Jim Benton called "great, kooky, monstrous fun," Olga wants to leave earth in search of Meh's home planet, but first she'll have to discover why Meh is acting so strange. 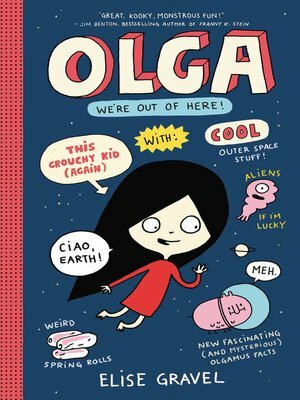 Olga: We're Out of Here is jam-packed with facts and fun: Elise Gravel's classic comic illustrations, hilarious word bubbles, space travel facts, and a diverse cast of memorable characters. Brightly.com put Olga and the Smelly Thing from Nowhere on their "Ultimate Summer Reading List for 9- to 12-Year-Olds." And Kirkus said of it: "A visually interesting mix of illustration and story, punctuated by numerous lists, comic panels, and cartoon diagrams and led by a smart female protagonist. A bubble-gum crowd pleaser with wide audience appeal."